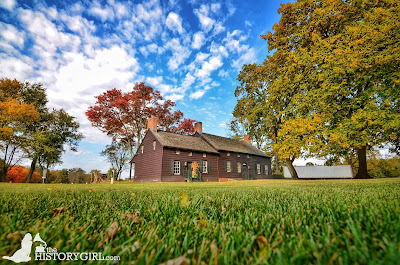 15th Annual Colonial Christmas at Bedminster’s Jacobus Vanderveer House - November 24, 2017 ~ The History Girl! Tree Lighting – Friday, November 24 – 7 p.m.
House Tours and Festivities – Saturday & Sunday, November 25-26 & December 2-3 -- 10 a.m. to 4 p.m.
A tree lighting, sponsored by Investor’s Bank, will kick off this year’s two weekend-long event on Friday, November 25 at 7:00 pm. The tree lighting is free to the community and features caroling with the Harmonium Choral Society, hot pretzels and hot chocolate. Knowledgeable docents, re-enactors and volunteers are available to provide information on the history and furnishings of the circa 1772 Jacobus Vanderveer House. “Whether you come to shop, grab a bite to eat at our Colonial Café, get decorating tips for the holidays, listen to musical performances, visit Santa, get an up-close look at a reindeer, make a gingerbread house with your child, or learn more about Dutch Colonial life during the American Revolution, there’s something for everyone at Colonial Christmas,” added Sutherland. Admission at the door is $10 (Members of the Jacobus Vanderveer House and children 12 and under, free). For a complete schedule of activities, visit www.jvanderveerhouse.org or call 908-396-6053. The Jacobus Vanderveer House is conveniently located near Routes 78, 287 and 22 at the River Road exit on Routes 202/206 in Bedminster, New Jersey. Enter through River Road Park. Parking, restroom, and dining facilities are available on site.